Following death of Nusra Front's spokesman, additional US airstrike kills scores more Al Qaeda fighters. The United States has carried out another raid against Al Qaeda terrorists in Syria, on the heels of a strike that killed the spokesman of the group's Syrian branch, the Pentagon said Wednesday. "I can confirm that the US struck a vehicle killing several Al Qaeda militants," said spokesman Matthew Allen. "The results of this strike are still being assessed." 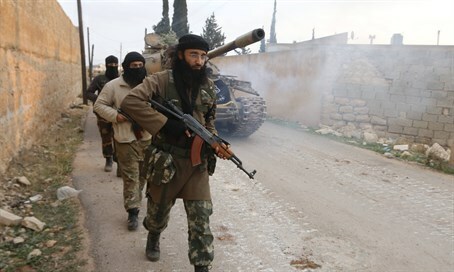 Al Qaeda's Syrian affiliate confirmed on Wednesday the death of its spokesman Abu Firas al-Suri in a US air strike. US strikes on the Al-Nusra Front in Syria have not been very frequent with their raids overwhelmingly targeting the Islamic State group (ISIS). Syrian peace talks which fail to address the question of President Bashar al-Assad's fate are "doomed to failure", a spokesman for the main opposition grouping involved in negotiations said. "If negotiations did not address the fate of Assad, it would be a waste of time and doomed to failure," he said late Tuesday at a forum hosted by Al-Jazeera in Qatar.